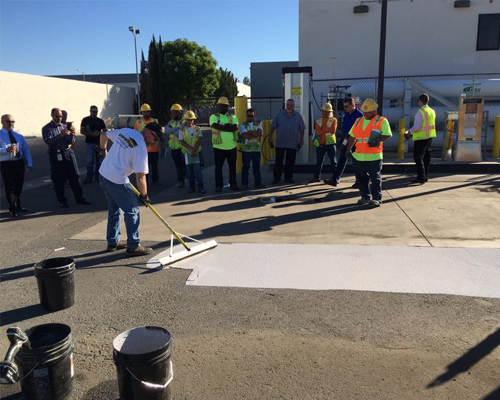 Recently GuardTop conducted a demonstration of our sealcoat product CoolSeal for engineers at the City of Los Angeles Bureau of Street Services. We applied a sample patch at the bureau’s street sweeping yard in Chatsworth, CA. Engineers and department workers were shown how the mixing and application processes work, and were able to witness first hand the benefits of CoolSeal compared to traditional asphalt based sealcoat. CoolSeal by GuardTop®, is an ultra high performance asphalt-based sealcoat that achieves lower surface temperatures with its lighter colored surface and higher reflectivity. Perfect for school districts, parking lots and LEED eligible building projects. Like cool roofs, which are lighter-colored and keep the air both inside and outside the building cooler by reflecting more of the sun’s energy, cool pavements reflect more of the sun’s energy. The benefits of cool pavements extend beyond just cooling the local ambient air. More reflective parking lots allow building owners and cities to save on energy needed to illuminate streets and parking lots. CoolSeal by GuardTop has been tested and certified to meet the industry standard 33 percent solar reflectance design goal and is a long-lasting product that will seal and beautify pavements for years to come. Using CoolSeal by GuardTop will produce measurable reductions in surface temperatures.